Luis Suarez could be the difference when Barcelona travel to Old Trafford. 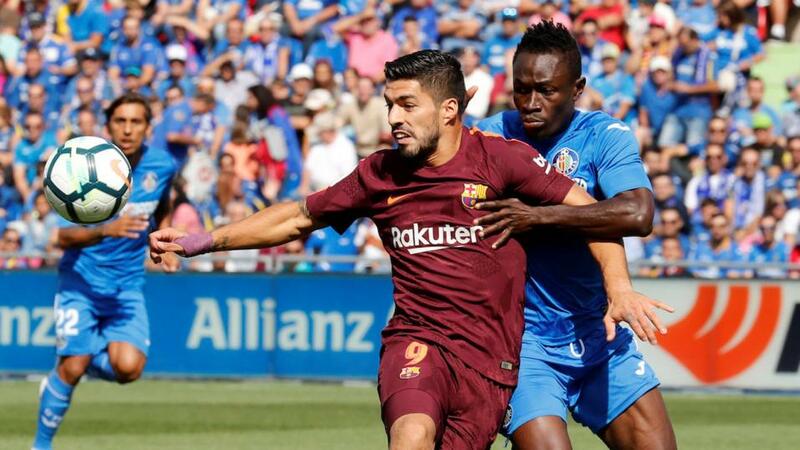 The Champions League is back this week and Jamie Pacheco picks the best same-game multi-bets from two of the matches, including Luis Suarez netting in a Barca win at Old Trafford. "Luis Suarez won’t be winning many popularity contests in the Manchester area but then again he’s not the sort of player who opposition fans have ever liked, is he"
Porto won't have fond memories of this fixture from last year in the Champions League given that Liverpool absolutely wiped the floor with them in the first leg in Portugal before 'chilling out' and playing out a goalless draw in the second leg back at Anfield. Is there anything to make us think it will be different this time round? Well, yes. That first leg was a freak occurrence and if anything, Liverpool haven't been quite as fluent in attack as they were this time last year. And they haven't been particularly great in defence, either. It's been a while since they've kept a clean sheet and Sergio Conceicao will know as well as the rest of us that failing to score at Anfield means that the tie is effectively over. Porto have been scoring quite a few recently and though you could easily argue that the Portuguese league isn't anywhere near the standard of the Premier League leaders, it's not that far-fetched that they could get a goal here given that the likes of Southampton and Fulham managed one over the past week or so. It's 21/20 that both teams get on the scoresheet and that's the first part of our bet. Sadio Mane is finally showing his true potential after being the least high-profile of Liverpool's famed front three and is perhaps in the form of his life. He has all the weapons to be one of the world's top forwards: raw pace, tricks, a good footballing brain and though his finishing isn't in the Ronaldo or Mo Salah category, it's still pretty good. Porto's defenders, including the 35 year old veteran Pepe, aren't blessed with great speed and sooner or later you'd think that a ball over the top or splitting the defence along the ground will leave the Senegalese one on one with the keeper. But any goal will do us just fine and a 11/10 it's worth chancing that he gets one. Especially since it's now eight in his last seven for Liverpool. Ole Gunnar Solskjaer has done wonders so far at Man Utd but just recently things haven't quite gone his way. And with a couple of notable exceptions, this is certainly one of the toughest fixtures he's had to face so far. Add in a few injuries and his inexperience in terms of managing big Champions League games and United fans would have good reasons to start fearing the worst here. After all, if PSG could school the Reds at home then you'd think Barcelona can as well. So it might just be worth taking the evens on Barcelona winning this against a side who have lost three of their last four games in all competitions. Barcelona haven't lost in 16 matches and that run included a brace of away wins against Real Madrid in two separate competitions and a 2-0 victory just this Saturday against the ever-resilient Atletico Madrid. Luis Suarez won't be winning many popularity contests in the Manchester area but then again he's not the sort of player who opposition fans have ever liked, is he? He's also the sort of player who will be at his best in a hostile environment where he has a point to prove. It's now seven from his last nine that he's scored in and that includes getting on the scoresheet in each of his last two games. As ever, all eyes will be on Lionel Messi but that might just play into the Uruguyan's hands and he's a considerably bigger price anyway so at 11/8, it's a good choice to go with the former Liverpool man.